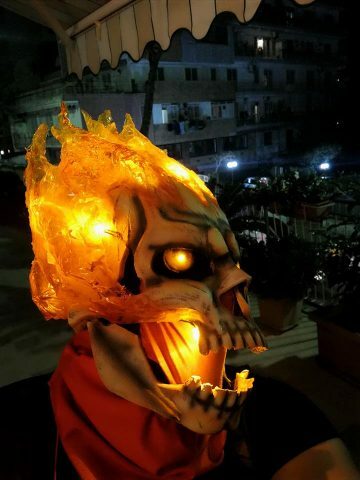 An Incredibly Fiery Ghost Rider Costume « Adafruit Industries – Makers, hackers, artists, designers and engineers! Prop Maker Vinny’s Model has figured out how to make Marvel’s Ghost Rider into a striking and somewhat intimidating costume. He dresses as the fully flamed out version of the character. 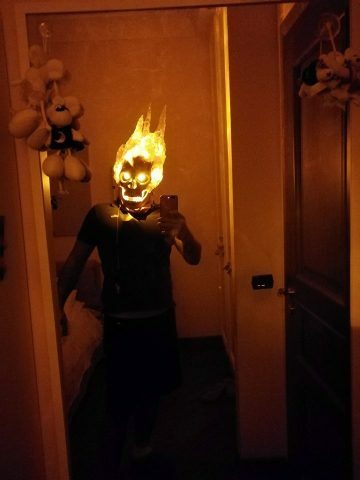 The skull mask is positively a piece of art, but the translucent flames are remarkable, too. It all comes together as a helmet piece with a movable jaw and LED lights on the eyes and flames. To achieve the flickering flame effect, Vinny makes the flames semi-transparent. He made Ghost Rider’s bike too, by adding a skeletal embellishment and LED lights. 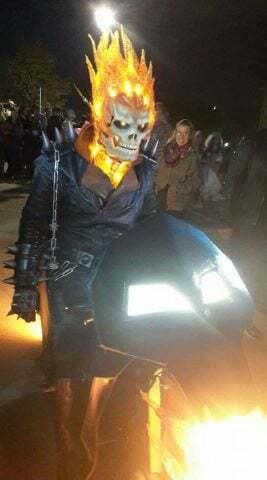 View more images of this impressive Ghost Rider costume below and visit Vinny’s Etsy store if you want a Ghost Rider mask of your own. Read more and see additional photos at Vinny’s Model on Facebook.